Retired Judge Wilfrid Dues poses at the 2018 celebration with the plaque on the Hall of Honor path honoring Mary Gould Brooke 1858-1946 and Edith Gould, 1855-1946. Granddaughters of Cornelius Van Ausdal, these sisters left their own legacy in the form of the “Brooke-Gould Memorial Fund” and its many substantial contributions to Eaton. Brooke provided leadership to the Preble County District Library, and was instrumental in establishing the first Preble County Historical Society, the Current Events Club and the Fort St. Clair Park. Gould’s life focused on music, teaching piano lessons, and serving a close co-worker and compatriot with Brooke. Family members of the 2018 Hall of Honor induction ceremony were recognized during the Preble County Historical Society’s celebration last July. At the unveiling of the 2018 Hall of Honor plaques, the brother of Susan Haines Kendall, 1952-2005 showed off her memorial. Preble County District Library director for 24 years, Kendall demonstrated her passion for gathering and sharing information by establishing the Internet era at PCDL and creating the library’s genealogy center that remains a resource for genealogical documents accessed by individuals all over the world. She modernized and expanded the library’s seven branches, including establishing the Eldorado branch, and provided leadership to state and local library and community organizations. EATON — Nominees for the Preble County Historical Society and The Register-Herald’s 2019 Hall of Honor are due Monday, April 1. In celebration of its 40th anniversary in 2011, the Preble County Historical Society (PCHS) created a Hall of Honor. The PCHS Board of Trustees designated that the Hall of Honor be named the Sara Swartsel Hall of Honor in recognition of the heritage and philanthropy of the Swartsel Family as demonstrated by Sara’s enduring gift to the Preble County Historical Society and the Preble County community of her family farm in southeast Preble County. The Register-Herald joined the PCHS as co-sponsor of the Hall of Honor in recognition of the natural partnership of the two organizations in recording the history of Preble County every day. This annual process provides each entity with many opportunities to collaborate publicly on the project in ways that promote the value of each entity to the residents and businesses of the county. In 2019 the Hall of Honor will induct its ninth membership class. Inductees must be deceased and have lived in Preble County at some point in their lives; further, they must meet one or more of the following requirements: have been outstanding in achievement in agriculture, arts, professions, politics, public service, education, or sports; or have a reputation that brings honor to the county, or personal commitment and service to the county; or had a lasting impact on the county. 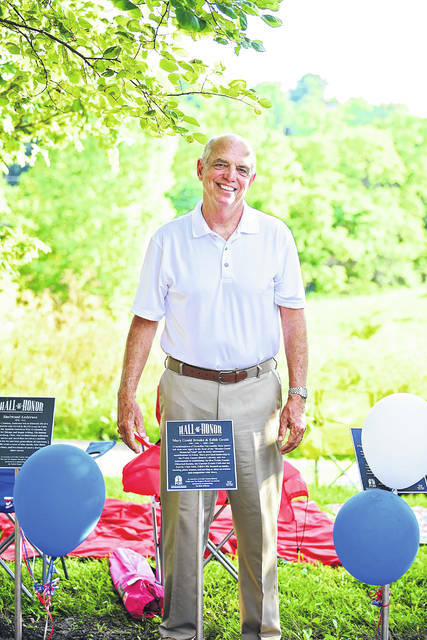 “We will honor the 2019 inductees and their families with the dedication of plaques in their honor at 6:30 p.m. on Sunday July 7, at the Old Fashioned Independence Day Celebration at the Preble County Historical Center and The Amphitheater,” Jean Bussell, a HOH coordinator said. Anyone can make a nomination to the Hall of Honor by visiting the Preble County Historical Society’s web site at www.preblecountyhistoricalsociety.org and downloading an application to complete and submit. Those interested in nominating someone can also email the Society at preblecountyhistoricalsociety@frontier.com or call the Society at 937-787-4256 and leave a message requesting a nomination form. https://www.registerherald.com/wp-content/uploads/sites/41/2019/03/web1_dues.jpgRetired Judge Wilfrid Dues poses at the 2018 celebration with the plaque on the Hall of Honor path honoring Mary Gould Brooke 1858-1946 and Edith Gould, 1855-1946. Granddaughters of Cornelius Van Ausdal, these sisters left their own legacy in the form of the “Brooke-Gould Memorial Fund” and its many substantial contributions to Eaton. Brooke provided leadership to the Preble County District Library, and was instrumental in establishing the first Preble County Historical Society, the Current Events Club and the Fort St. Clair Park. Gould’s life focused on music, teaching piano lessons, and serving a close co-worker and compatriot with Brooke. 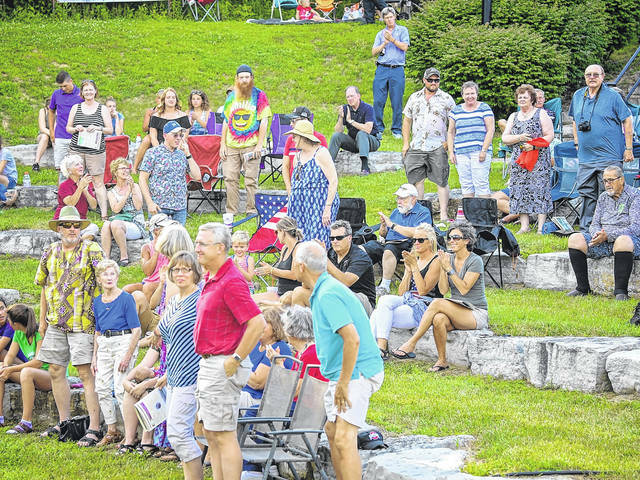 https://www.registerherald.com/wp-content/uploads/sites/41/2019/03/web1_family-members.jpgFamily members of the 2018 Hall of Honor induction ceremony were recognized during the Preble County Historical Society’s celebration last July. 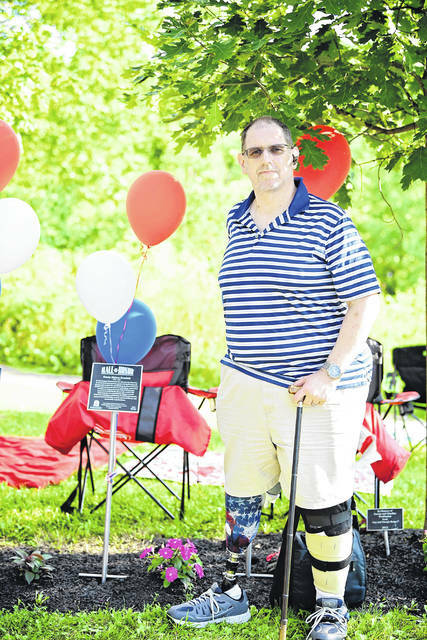 https://www.registerherald.com/wp-content/uploads/sites/41/2019/03/web1_susans-brother.jpgAt the unveiling of the 2018 Hall of Honor plaques, the brother of Susan Haines Kendall, 1952-2005 showed off her memorial. Preble County District Library director for 24 years, Kendall demonstrated her passion for gathering and sharing information by establishing the Internet era at PCDL and creating the library’s genealogy center that remains a resource for genealogical documents accessed by individuals all over the world. She modernized and expanded the library’s seven branches, including establishing the Eldorado branch, and provided leadership to state and local library and community organizations.